Jade has been highly valued since centuries ago for both its beauty and symbolism. On top of that, we think they’ve got a personality of their own as well. Here’s introducing the 9 personalities of our very own jade bangles – and we wonder which one best describes you! Charismatic people are adept at knowing what takes center stage. When they walk into a room, all eyes naturally fall on them. The Kebaya Jade Bangle has the same magnetism that draws us in - the fine craftsmanship of the intricate motifs reflects devotion to detail with exquisite, handcrafted filigree and lavish arrays of precious gems. Dressed in a chiffon floral dress twirling amidst a garden filled with the fragrance of flowers in full bloom, the Romantics’ heart is filled with content. The Romantics are passionate individuals who are filled with emotions and dream of an ideal life. Their zest, passion and femininity are captured in the intricate carvings of the Cherry Blossom flowers. Open the wardrobe of a feminine woman and you would find all things lovely, including countless number of ruffles, lace and flower prints. Among all the bangles, nothing speaks to The Feminine quite like the Sakura Jade Bangle. The Sakura is a favourite among many cultures for its beauty and fragility, symbolising the transience of life. Focused on design and art, The Contemporary stands for individual and artistic expression. No doubt will they enjoy the modern aesthetic of the Peranakan Lace Bangle, a collection whose inspiration references the finesse of traditional needlework. The complexity of filigree married with hints of heritage and oriental elements makes this bangle a wearable piece of art. Far from boring, The Minimalist enjoys a simpler look but with a touch of personality. 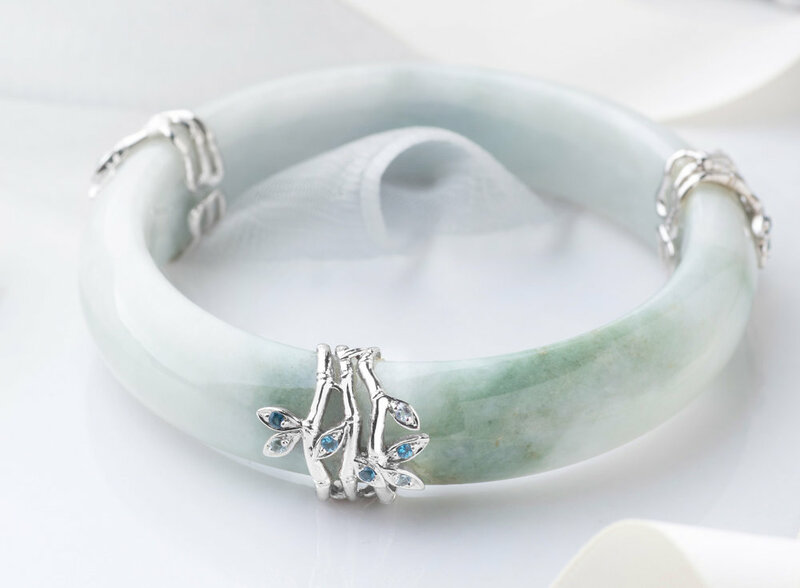 Not too ornate or elaborate, the stacked gemstones of the Shophouse Jade Bangle add colour and character that is unique to each individual. Although very similar, The Classics should not be mistaken for The Minimalist! The Classics are your elegant, no-nonsense individuals who are known for their timeless style, and prefer designs that are uncluttered, balanced, and evergreen. The three weaved charms evenly sculpted around the Bamboo Trio Bangle exudes stability and elegance at its finest. A tad more demanding than The Classics, The Sophisticated is not easily satisfied. These individuals are not only dressed elegantly, they are also connoisseurs big on luxury and heritage. The intricate weaves of the bamboo motifs give the classy and modern touch to the bangle while the symbolism of bamboo truly embodies one who is strong and unwavering. Right on the other spectrum would be The Glamorous, whose life is filled with colour and flair while retaining a class of her own. No stranger to having the spotlight on her, the bold and elaborated design of the Classic Peranakan Bangle, together with its coloured semi-precious gemstones, is the ideal statement piece to share the attention. The saying "old is gold" cannot be any more apt to describe The Nostalgic who finds beauty in our heritage and wears them with utmost pride. The motifs of the Peranakan Trio Bangle were inspired by the elaborate patterns and pastel shades that the Peranakans are famously known for. Our bangles are exclusively available at our Mandarin Gallery Flagship Boutique. To discover and explore our range, schedule an appointment or request a complimentary consultation via hello@chooyilin.com.